This information by Dr. Salla goes along with the video in the previous post, as well as this prior Kp blog post. I found it helpful to read his analysis. As always with Dr. Salla’s articles, I’m posting 1/3 of the article, highlighting from the full article, and linking to the original at the end. Some may also wish to check out Dr. Salla’s latest book, “Antarctica’s Hidden History: Corporate Foundations of Secret Space Programs“. “QAnon has repeatedly referred to the movie the Sum of All Fears in posts dating back to November 2017 that suggest the Deep State is involved in an effort to foment a nuclear false flag attack on the United States. 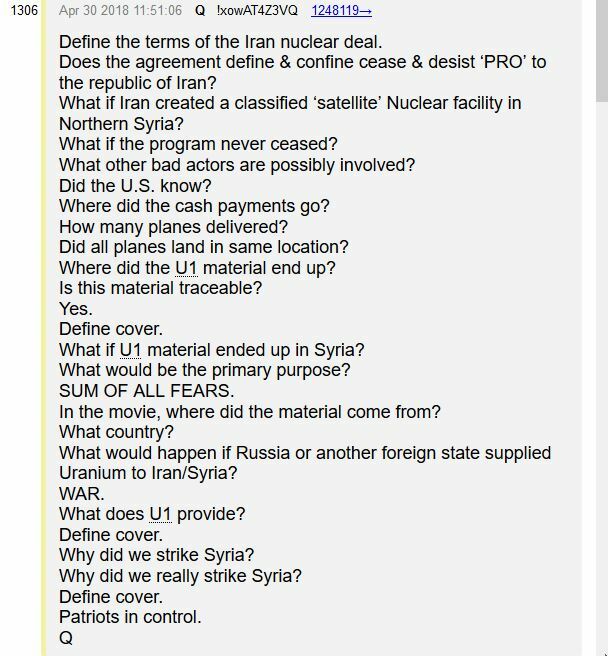 In the most recent post QAnon explicitly says that a nuclear weapons facility being secretly assembled in Syria would use uranium that could be linked to Russia… [and] that after a false flag nuclear attack on US territory, the uranium would be traced back to Russia, and the stage would be set for forcing the US military to launch a retaliation that would precipitate World War III. “…the consensus of many analyzing his/her posts is that QAnon represents a group of very senior military intelligence officials working with the Trump Administration. According to Dr. Jerome Corsi, it was a group of three military generals that approached Trump to run for President in 2015, in order to help the US break free from Deep State control and prevent covert efforts to orchestrate World War III. “First, QAnon tells us that Iran had secretly built a nuclear facility in northern Syria: What if Iran created a classified ‘satellite’ Nuclear facility in Northern Syria? What if the program never ceased? What other bad actors are possibly involved? The term “bad actors” is a reference to rogue operators that are linked to the Deep State, who enabled this nuclear facility to be secretly assembled. “QAnon goes on to say that the nuclear material being used in this satellite Nuclear facility in Syria had been arranged by the Deep State:… Here QAnon asserts that the Uranium One (U1) deal reached between the Obama administration and Russia back in 2009, when Hillary Clinton was Secretary of State, was designed to supply Russia with uranium that could be traced back to the US. The Deep State plan was to use the U1 uranium at the secret nuclear facility in Norther Syria, to build a nuclear device that would be detonated in the US… In the movie the uranium came from a US source. “QAnon is telling us that the chemical weapons justification used by President Trump to authorize the strike was a charade, a cover. The US military was really targeting the secret nuclear facilities ostensibly controlled by Iran, but were in fact Deep State assets. This would help explain why the Russians stood down in the US coalition attack on its ally, Syria. “…in the movie, the actors involved in the false flag attack is connected to a secretive neo-Nazi group. In a March 10 post, QAnon also links the effort to frame Russia in a nuclear attack on the US to a secretive Nazi group. “…QAnon is suggesting that the North Koreans had likewise been helped by a Deep State/Nazi group that had supplied it secret nuclear assistance. After Kim Jong-Un realized that the Deep State had betrayed him by attempting to frame North Korea in a failed nuclear attack on Hawaii, the North Koreans decided to end their cooperation with the Deep State. “The picture that is emerging from QAnon’s April 30, March 10 and other posts is that the repeated references to The Sum of All Fears movie is revealing a secretive effort by the Deep State to contrive a nuclear war through a false flag attack on the US. QAnon’s information here dovetails well with my own research into a breakaway World War II Nazi group linked to occult secret societies that established underground facilities in South America and Antarctica. Gallery | This entry was posted in apocalypse, cabal, disclosure, energies, new energies, partners in contrast and tagged Deep State, Exopolitics.org, Hillary Clinton, Iran, Michael Salla, President Donald J. Trump, Q, Q Anon, The Alliance, Vladimir Putin. Bookmark the permalink.